If you are laughing and thinking, “HUH?” that’s ok…you’re not alone! Just to quickly recap-every Wednesday you can drop by here and find new and special happenings in the Secret Garden. There’ll be crafts, great food, fun and laughter. So please be sure to come by and see us in our Secret Garden created just for you. NOW…let’s talk porridge. Porridge is a dish made by boiling ground, crushed, or chopped starchy plants – typically grain – in water or milk. Wikipedia Despite its gloppy appearance, it is actually quite tasty. Basically it’s similar to oatmeal that many of us eat for breakfast. Porridge is traditional and common in the English-speaking world, Germany and the Nordic countries. Oat porridge has been found in the stomachs of 5,000-year-old Neolithic bog bodies in Central Europe and Scandinavia. Porridge with Treacle was also a staple in the book The Secret Garden so I included it as ob of our tasty treats in A Year in the Secret Garden. Porridge is a dish made by boiling ground, crushed, or chopped cereal in water, milk, or both, with optional flavorings such as sugar, cinnamon, nuts, raisins, is usually served hot in a bowl or dish. Have you ever noticed that in most of our favorite children’s classic stories that they are always serving porridge or it’s bad version equivalent gruel ? There’s probably a good reason for that. Many of our favorite books are set in England or Great Britain. Northern Europe including Scandinavia have been eating porridge for centuries. I love the oat porridge of England and Scotland. My parents being from Sweden meant I ate a rice sort of porridge known as groat. Porridge can be made from any type of grain and is so very good and tasty. According to the Daily Telegraph, porridge transformed mankind. Porridge is a hearty meal that can be modified to either a sweet dish or a savory dish depending on how seasonings are being added. Over the past couple hundred years, porridge is eaten as a breakfast meal and let’s one stay full most of the day. In the story the Secret Garden, people ate two meals a day. Porridge in the morning and then supper at night. It was only the upper classes that would have more than two meals a day. 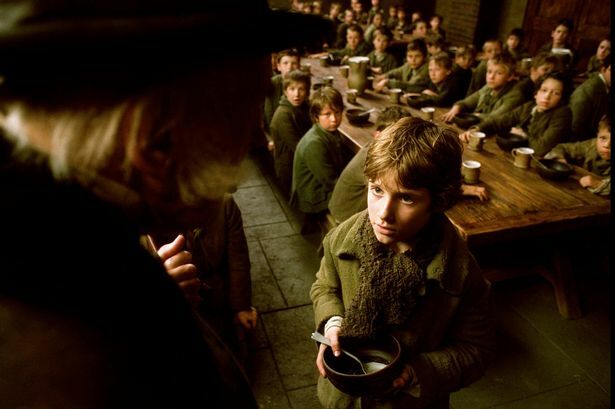 In other literary favorites such as Oliver Twist, “each boy had one porringer, and no more – excep t on occasions of great public rejoicing” – has been viewed as a watery symbol of deprivation. The watery deprived version of porridge is known as gruel. The Roman armies as they occupied Great Britain were fed ‘water-gruel.’ Later various prison systems in Great Britain would serve their prisoners water-gruel and the term “doing gruel or doing porridge” became a term for being in prison. Let’s look back a little bit into history and really see where the story of porridge leads us. Those who lived on the edge of starvation had to make use of every edible item they could find, and just about everything could go into the pot (often a footed kettle that rested in the fire rather than over it) for the evening meal. This included beans, grains, vegetables and sometimes meat — often bacon. Using a little meat in this manner would make it go farther as sustenance. To really understand porridge we really must go to Scotland. Porridge or Parritch is one of the national dishes of Scotland. Traditions surround the making and eating of porridge. Stirring should always be done clockwise (for luck) with a spirtle or theevil, a wooden stick tapering to a rounded point, for stirring, and a carved head. In Scots, porridge was always referred to in the plural and was customarily eaten while standing, but the reasons for this latter custom aren’t really known. Some think it was due to the proverb: “A staunin’ sack fills the fu’est” (A standing sack fills the fullest), while others thought people ate standing up in case of a surprise enemy attack. Once cooked, the porridge is ladled into porringers (bowls) with a separate bowl of milk, buttermilk, or thin cream close by. Each spoonful of porridge was dipped into the cold liquid and then eaten. Some sprinkled sugar over the porridge, and others preferred honey, treacle or syrup, or a small square of butter. Porridge was sometimes poured into a drawer in the kitchen dresser to be sliced when cold, either for eating out in the fields or for reheating in the evening. Porridge is highly nutritious because oatmeal contains protein, carbohydrate, fats, and soluble fiber, all the B vitamins, vitamin E, calcium, and iron. For the very poor in Great Britain, porridge prevented scurvy and other ailments from the lack of vitamins A, C, and D when one added milk and vegetables to the porridge. So now we get to the sweet stuff. For those of us who live in the United States, treacle will be a mystery but I’m hoping to end that for you right now. For those of you who live in Great Britain or the Commonwealth I imagine treacle has found a way to your heart , stomach, and table. Treacle is what we call molasses here in the States. Treacle is any un-crystallized syrup made during the refining of sugar. The most common forms of treacle are the pale syrup known as golden syrup and the darker syrup usually referred to as dark or black treacle. Dark treacle has a distinctively strong, slightly bitter flavor, and a richer color than golden syrup,yet not as dark as molasses. Golden syrup is the main sweetener in treacle tart. For those of you who are Harry Potter fans, Treacle Tart and Treacle Pudding were among Harry’s favorite foods. Molasses has a stronger and more robust taste than treacle. In the US molasses is found in bottles in the baking section of your grocery store and treacle can be found in cans/tins in grocery stores in Great Britain. Hungry? Even if this information didn’t make you want to mix up a bowl of hot oatmeal, just think of how unique the above info was! There’s more of these fun, time-period-related recipes, crafts and activities in my book. Next Post Author Katherine Paterson is coming to Maryville,Tennessee!